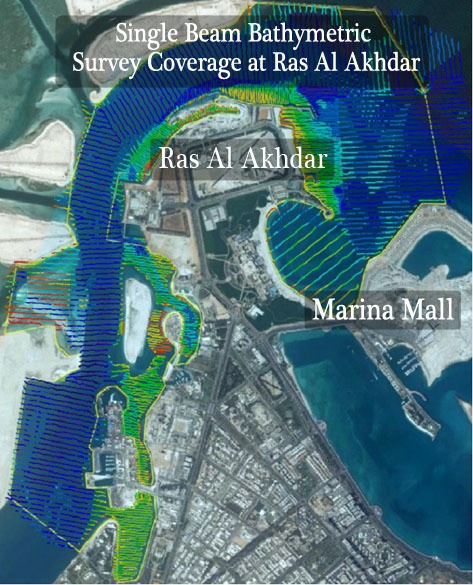 Project: Bathymetric, Oceanographic, Topographic & Geophysical Study of Lulu Island Abu Dhabi. 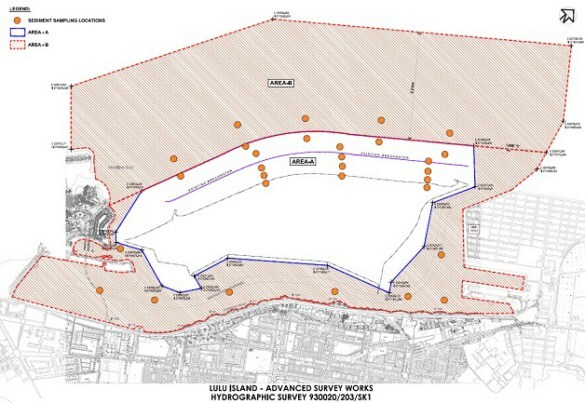 SGS were contracted to carry out selective sections of a full marine & terrestrial study of Lulu Island and the surrounding marine areas for a proposed major construction project. Data collection was to be used for hydraulic modelling and construction design. 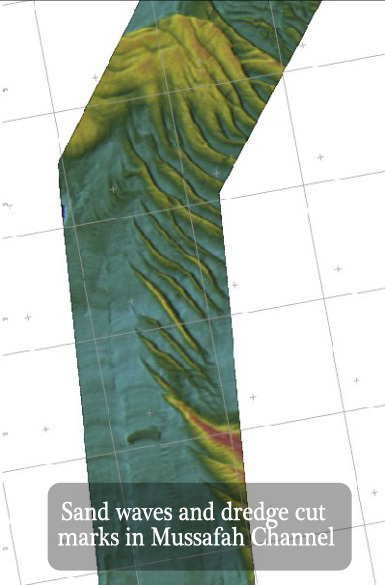 The scope included Transfer of 3D survey control from the mainland to the island, multibeam bathymetry, single beam bathymetry, sidescan sonar, sub bottom profiling, weather observations, tide measurements & analysis, static ADCP measurements (currents & waves), moving ADCP measurements (current profiles), sediment sampling & analysis. A significant amount of detail on the island was surveyed including buildings, plantations, roads, tracks, buried utility markers, above ground utilities, and also included an offshore breakwater. 2 survey vessels and 1 amphibious vehicle were mobilised for the project which also necessitated deployment of multibeam & single beam echo sounders, a sub bottom profiler, a sidescan sonar, a self recording tidegauge, a weather station, 1 vessel mounted ADCP current meter, 1 seabed mounted ADCP Current/Wave meter, a Van Veen grab, and various GPS systems. On completion SGS submitted all survey data in raw format, ASCII, DWG, Excel and Geotif formats along with a comprehensive survey report. Project: Multibeam Bathymetric Survey – Offshore Dredge Borrow Area. SGS successfully tendered for this project, the aim of which was to conduct a monthly multibeam bathymetric survey of the dredge borrow area situated approx 12km offshore from Umm Al Quwain in the United Arab Emirates. The survey results were to be used to calculate monthly dredged volumes. The borrow area was being utilised by several large trailer hopper dredgers owned by the JV company of Dredging International and Boskalis Westminster Middle East. The material being dredged was transported ashore to form the reclamation for the Mina Rashid Port expansion in Dubai. The survey contract was expected to run approximately 18 to 24 months but was cut short when the project owner Nakheel stopped the reclamation works in light of the worldwide economic downturn. SGS eventually only surveyed the borrow area on 2 occasions the second one being the complete borrow area. Project: Multibeam Bathymetric Survey of Mussafah Channel (30km) Abu Dhabi. SGS were successful in securing this project through a competitive process. The client will be shipping large barges of raw material through the Mussafah channel to their plant for processing. The route they will cover is approx 30km. The scope of works was to survey the navigable channel and identify any areas which would be a hazard to their deep draught barges. 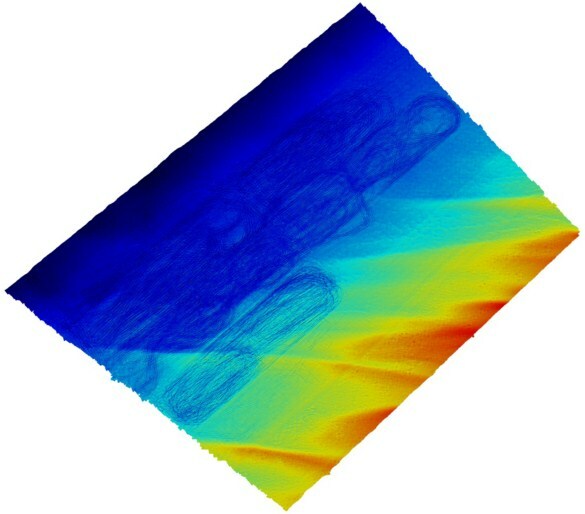 The results identified several problem areas including some quite spectacular sand wave and dredge scar images as seen in the section below. Project: Bathymetric, Oceanographic & Geophysical Study at Ras Al Akhdar Abu Dhabi. SGS were contracted to carry out a full study of the Ras Al Akhdar Peninsula for a major construction project. Data collection was to be used for hydraulic modelling and construction design. The scope included single beam bathymetry, sidescan sonar, sub bottom profiling, weather, tide, current & wave measurements, temperature & salinity profiles and water & sediment sampling. Seabed cables/pipes & obstructions were also identified. 4 separate survey vessels were used for the project which also necessitated deployment of a single Beam Echo sounder, Sub bottom Profiler, Sidescan Sonar, Cable Tracker, 3 tidegauges, a weather station, 2 ADCP Current meters, 2 ADCP Current/Wave meters, a Van Veen grab, a direct reading Current Meter, an SV probe, a Van Doorn water sampler and various GPS systems. SGS successfully secured this prestigious contract through a competitive tendering process. “The World” is a high profile dredging & reclamation project, the construction of which has been the subject of a National Geographic Special programme. The project is about 4km off the Dubai coast covering an area of approx 9.5km by 7.5 km and contains almost 300 man made islands surrounded by 26km of artificial reefs & breakwaters. (www.theworld.ae). SGS deployed their vessel “Kashif” to the project, fitted with a Reson Seabat 8101 multibeam sonar interfaced to state of the art positioning, motion and attitude sensors. Custom built high specification PC systems were used for the data collection and processing of over 600,000,000 soundings & spot heights gathered during the survey. Average error on consecutive weekly patch tests during the 9 week survey period ranged between 1cm and 5cm. Additional vessels & equipment deployed to site were “SGC 1” a 60ft landing craft fitted with auxiliary generators, fuel, water & septic tanks, and a portacabin for office & accommodation space. The “Horyah” was used as a general purpose vessel for supply of fuel & water to the landing craft, and removal of foul water & septic waste for shoreside disposal (strict environmental controls dictated that no waste water of any sort was to be disposed of into the sea). “Salman 4” was used as general transport to & from shore for personnel, and “Gammarus” was utilised for shallow water single beam bathymetric data collection over the shallow reef areas, and by land survey teams for transport between islands. The 3 land survey teams utilised RTK GPS systems either on foot, mounted on a quad bike, or on one of our 2 Argo Cat amphibious vehicles (1x 6wd & 1x 8wd). This allowed survey data to be gathered on some very uneven terrain quickly and accurately. On completion, a series of 43 A1 sized charts were supplied to the client with high density soundings, contours, design profiles and cross sections. 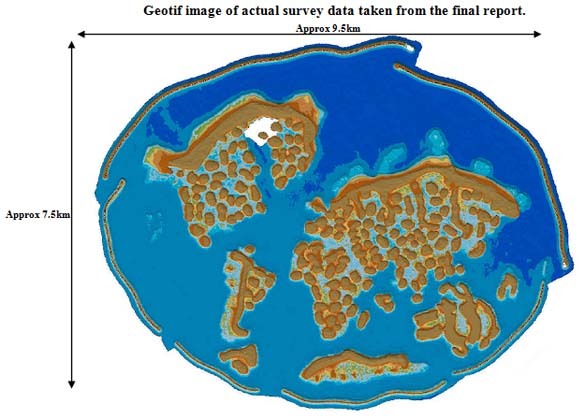 Data was also provided in PDF & ASCII format, and a Geotiff file was created of the survey data for merging with aerial photography.